Spanning seventy years of turbulent Tyneside history, the five books in The Great War Sagas are: The Suffragette/No Greater Love, and A Crimson Dawn, and The Tyneside Sagas are: A Handful Of Stars, Chasing The Dream, and For Love And Glory. Emily Davison, the suffragette from Morpeth Northumberland,who threw herself under the King’s horse at the Epsom Derby in 1913, was the inspiration for this gritty, fast paced novel. Heartbreakingly moving at times, this is a passionate story of a stubborn, self-willed woman’s battle for personal freedom. Very often the suffragette movement is associated only with London but there were many brave women in the North who got involved in the fight for the vote and this novel is a tribute to them. “The Suffragette is very popular at Brandon library!” – Brandon library, Durham. 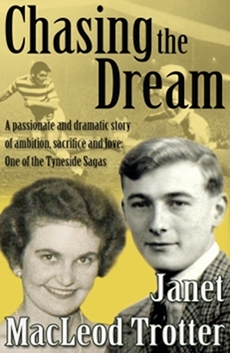 Emmie Kelso is only nine years old when she’s rescued from a dingy Gateshead tenement. Sent to Crawdene, a mining village on the fell, she’s taken into the vibrant, loving household of the MacRaes and brought up as one of their own. Blossoming into an intelligent and spirited young woman, Emmie is soon swept off her feet by handsome miner Tom Curran. But it’s only after their wedding that she learns of his possessive, violent nature. As war engulfs Europe in 1914, the community divides. Tom enlists and despite his disapproval, Emmie joins the MacRaes, among others, in their cries for peace. Working with those opposed to the war, Emmie finds herself alongside Rab, the MacRaes’ eldest son and a conscientious objector, and their childhood devotion to each other sparks into a love too strong to hide. As the war worsens, the atmosphere grows ever more tense. Women hand out white feathers to those refusing to defend their country and Rab, arrested as a ‘conchie’, faces the ultimate penalty. And when a brutalised, war-weary Tom returns home, there’s trouble ahead. The war may be drawing to an end, but Emmie’s fight for happiness is only just beginning …. It’s 1931 and the Depression has brought Tyneside to it’s knees. Businesses are struggling all over and the Magees’ fancy-goods shop is no exception. Seventeen-year-old Clara Magee is devastated when her father commits suicide. It’s bad enough he’s left his wife Patience and the family with nothing; they hadn’t expected to inherit his secret gambling debts. Facing ruin, the Magees are forced to sell their business to a German couple whom Patience resents. Despite her mother’s disapproval, Clara befriends their daughter Reenie and hot-headed son Benny. Patience Magee thinks old family friend Vinnie Craven would make far better company for her daughter, and Vinnie’s admiration of Clara is obvious to all. Yet her heart lies elsewhere – with Reenie and Benny’s dashing elder brother Frank. When Frank leaves abruptly for Germany, a disappointed Clara tries to dismiss her feelings for him. Increasingly flattered by Vinnie’s single-minded attention, she eventually accepts his proposal of marriage. But Clara hadn’t bargained for Vinnie’s violent temper and his growing fascination with Mosley’s Fascist party. As darkness gathers in Europe, Clara discovers more evidence of her husband’s disturbing political views. But the greatest shock is still to come. Spanning two generations from the 1920’s to the 1950’s, it is a vivid portrayal of South-East Northumberland and of Tyneside. Set against the tough backdrop of a mining town, there is both hardship and glamour, as Chasing the Dream explores the region’s passion for football. Millie, haunted by childhood poverty and eviction, sees security and happiness in the form of handsome but wayward Dan Nixon. Dan pursues his own dream of playing professional football as a means of escaping the hardship and dangers of the mines and for a while it seems their dreams will come true. But tragedy strikes and a terrible, long-kept secret is exposed which test Millie’s fortitude and dreams to the limit. Passionate and dramatic, Chasing the Dream is a compelling story about the cost of ambition and the sacrifices we make for love. This novel is about the survival of the human spirit despite all that fate throws at us. When Millie’s dreams begin to unravel, it is her strength of character and her deep compassion that count. The football theme was inspired by a walk down Northumberland Street in Newcastle and passing the statue of United’s legendary striker Jackie Milburn. With my family, I’ve followed Newcastle United to Wembley in recent years, but have yet to see them repeat the triumphs of Milburn and his team-mates in the 50’s. We’re still chasing that particular dream! Tom-boy, Jo Elliot grows up on Tyneside in the 1960’s with her widowed father and older brother Colin and his friends. She has a special bond with the lively but rebellious Mark Duggan who is rejected by his father and ignored by his hostile brother Gordon, to whom he can never measure up. Mark longs for acceptance, but it is mature and masculine Gordon for whom Jo falls dangerously in love. Tragedy unfolds that leaves Jo outcast from her old friends. As she tries to rebuild her life, war breaks out in the Falklands and both Colin and Mark are called up to fight before she can make her peace. 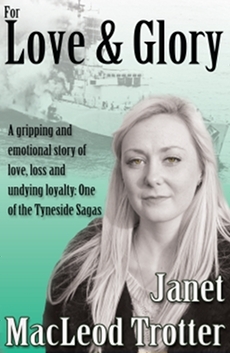 The novel is set in Wallsend on the River Tyne from where my husband’s family come from. I’m indebted to them for background information on this vibrant community where many of the world’s greatest ships were built. 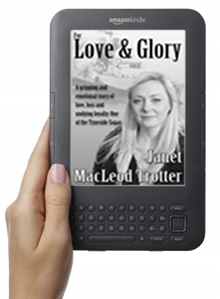 A new edition of For Love and Glory was released on 2nd April 2012 to coincide with the 30th anniversary of the start of the Falklands war. It is available in paperback and in ebook editions in Kindle (Amazon.co.uk and Amazon.com) and other e-Reader formats.